A novel amperometric magnetoimmunoassay, based on the use of core–shell magnetic nanoparticles and screen-printed carbon electrodes, was developed for the selective determination of Legionella pneumophila SG1. A specific capture antibody (Ab) was linked to the poly(dopamine)–modified magnetic nanoparticles (MNPs@pDA-Ab) and incubated with bacteria. 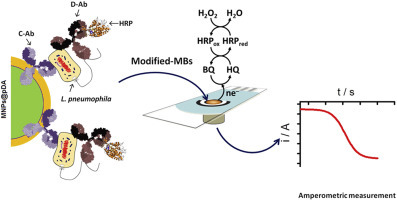 The captured bacteria were sandwiched using the antibody labeled with horseradish peroxidase (Ab-HRP), and the resulting MNPs@pDA-Ab-Legionella neumophila-Ab-HRP were captured by a magnetic field on the electrode surface. The amperometric response measured at −0.15 V vs. Ag pseudo-reference electrode of the SPCE after the addition of H2O2 in the presence of hydroquinone (HQ) was used as transduction signal. The achieved limit of detection, without pre-concentration or pre-enrichment steps, was 104 Colony Forming Units (CFUs) mL−1. The method showed a good selectivity and the MNPs@pDA-Ab exhibited a good stability during 30 days. The possibility of detecting L. pneumophila at 10 CFU mL−1 level in less than 3 h, after performing a membrane-based preconcentration step, was also demonstrated.